Automotive Groups have recently started to engage in large digital transformation programs triggering major internal changes to fill the gap with other “customer-oriented” industries. 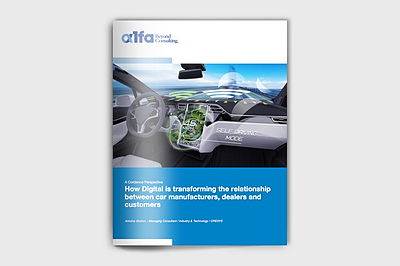 Almost all Automotive Groups now have digital departments, with generally strong communication within the digital transformation and the customer approach. The customer approach topic is in fact a real challenge for car companies as it implies changing their business model and adjusting their mindset to address the customer 4.0: from product-centric to customer-centric, from car manufacturer to service provider. For this reason, our group CWW has prepared the following perspective that identifies the ways Digitalization is making waves in the automotive industry. Click below to download the white paper in PDF and feel free to contact us if you have any further questions.